My latest beauty swag consisted of Anastasia's Want You to Want Me eye shadow palette and their Kisses on My Lips gloss set. Both of these are new for the upcoming holiday season and I was super excited to get to try them out for myself. 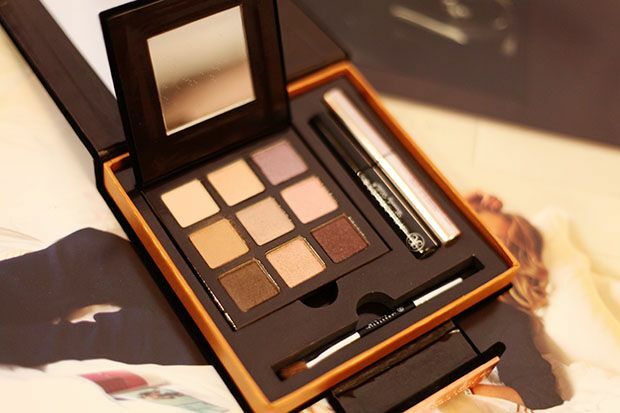 There were two things I really loved about the Want You to Want Me eye shadow palette. (1) The kit is actually within a clutch so it's great to carry around on its own. It's a nod to the 1970's with rock-inspired shades. (2) The liquid eyeliner is amazing. Absolutely amazing. I usually have trouble finding liners that stay on long enough without smudging; however, I got through a teary-eyed episode of Mad Men with the liner staying perfectly intact. This crybaby is thoroughly impressed. I love this palette and it's definitely worth the price with all the swag that comes with it (liner and eyebrow gel). When it came to the Kisses on my List gloss set, to be honest, I didn't even try it. I've never been a lip gloss fan so I thought...why not give it away to someone who'll actually cherish it? I read up reviews on Sephora and everyone is raving about how gorgeous and long-lasting the colors are. Apparently they also have long-term benefits for your lips! $30 for 6 phenomenal glosses...I think that's a deal worth fawning over. Good luck! The last day to enter is 10/10! The fall-line up for TV, especially HIMYM. & all the pumpkin seasonal flavors. I most excited for Halloween. GFC under this same user name. I can't wait for my Urban Decay Vice palette to arrive! I'm most excited about Halloween! i follow you on twitter as @TEBblog! i'm now following by gfc. i'm most excited for scarfes in October! Most looking forward to Halloween! I'm a GFC follower, and in October, I'm most excited for... this Thanksgiving weekend! :) get to go home for the long weekend haha . I'm a GFC follower and I'm most excited about Halloween and watching scary movies! I follow you. I love The fall weather and chocolate candy. I can't wait for Christmas..cause October it's just another dull month!! I follow you on Bloglovin' (Alice Beerland)! I follow you on twitter (@alicebeerland)! I like you on Facebook (Alice Beerland)! I am most excited about the cool, crisp weather! What I'm most excited about is my b day!!!! Most excited about my new job. I follow you on Bloglovin (174) and to complete first entry.... MOST excited for Halloween! I forgot to tell you that i love the bueatiful colors of the trees and i love the cold weather. I follow you on GFC and can't wait for Halloween! I'm excited for the cooler weather!